If you are a physically active adult who works out at least 30 minutes (of moderate activity) daily, you should be eating 1.5 to 2 cups of fruit per day and 2 to 3 cups of vegetables each day. All in all, 50% of the total population in the United States reported eating less than 1 cup of fruit and less than 1.5 cups of vegetables per day. Integrate tasty recipes like stir fries into the weekly family menu. When eating out, choose a vegetarian or vegan restaurant or one that offers a wide range of healthy vegetarian dishes. Plan for at least 2 meatless dishes per week, vegan and vegetarian options taste delicious while featuring a wide range of vegetables. Make healthy soups (particularly in the winter months) and add a variety of fresh herbs and vegetables. Roast root vegetables (such as sweet potatoes, leeks, carrots, and beets) drizzled with olive oil and topped with fresh garlic cloves and rosemary. Substitute sweet potatoes for the more starchy and higher calorie white potatoes as a healthy side dish. Steam a large pan with a variety of tasty vegetables, including broccoli, cauliflower, sweet potatoes and carrots, then drizzle with a small amount of olive oil, salt and pepper. If you have access to a local CSA (Community Supported Agriculture), be sure to give it a try, it’s a great way to try new produce. Most CSA’s include tasty recipes in their baskets for innovative new ways to incorporate fresh vegetables and fruits into your daily meals. Keep plenty of produce in the fridge and/or in fruit baskets–wherever it’s most convenient. Include 2 to 3 types of fruits and vegetables in to go containers for lunch and snacks. Hide vegetables you don’t really like (such as kale) in smoothies-such as, a pineapple and kale flavored drink. Substitute great tasting fruits (such as raspberries and whipped cream), for sugar laden desserts. Add a variety of fruit, fresh nuts, coconut, honey, and other healthy toppings to low fat yogurt. Make tasty dips (such as pumpkin cashew butter) for dipping raw apples. Prepare raw vegetables such as cauliflower, carrots and celery to dip in healthy, low-fat dip (like hummus). Add fresh fruit to low fat frozen yogurt for a healthy and great tasting dessert. 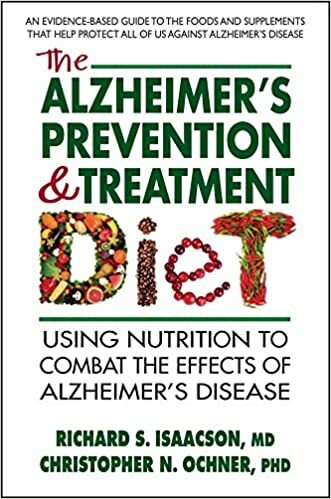 Learn more about the Alzheimer’s diet by CLICKING HERE to check out the book, “The Alzheimer’s Treatment and Prevention Diet,” written by Harvard trained neurologist, Dr. Richard Isaacson, M.D.